More efficient than Atmospheric type and shell & Tube Condensers. Uses very little water in comparison with to Atmospheric Condensers. Keeps condensing pressure low, there by reducing power consumption. 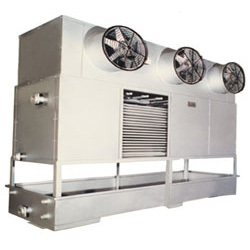 Require very little space compared to Atmospheric Condensers and can be fitted over the roof top. Scaling is reduced to minimum, since plain tubes are used.